OK – we are leaving tomorrow and should arrive in Trois Rivieres sometime in the afternoon. I need a day of rest! Montreal is exhausting, especially after the great Bixi biki experiment! We left at 8:00 this morning and collected a couple of Bixi bikes. Dennis drove off at great speed (why?) and I struggled behind, thinking that I must be very tired. I finally realized that my bike had a flat tire (no wonder I had to push so hard) so at the next station, I switched bikes for a better one. We drove on the bike path towards Mount Royal and were in good company. There were hundreds of people riding their bikes, so it was a good thing that we had our own safe bike lane. Most people were dressed in business clothes. We eventually got to the bottom of Mount Royal and were going to turn our bikes in and walk up to the top but the station was full of bikes. This was a good thing because it is a long way up! We drove and drove up the mountain (hill?) and it just about did us in as the Bixi bikes only have three gears and probably aren’t made for hills! We finally reached the top of Mount Royal and were glad that we got to the top as the view is spectacular. I am including a picture of the Bixi bike just to prove that we did this. Our way down the hill was pretty fun until I took a wrong turn so we lost the path and ended up in a residential area that was very steep. I started going down the hill and my brakes kept making this horrendous noise. I decided to walk for a while because I was worried that the brakes would give out! Dennis volunteered to switch bikes (we were very hungry by then as we had not had breakfast) so he was motivated to finish the ride. So, when he went down the hill, the brakes screeched too but he continued on. Meanwhile, I was braking as hard as I could with his bike and got down the hill in one piece. We eventually found a station and turned in the bikes and went to Paris Crepes for breakfast. It was delicious! We walked the rest of the way back to the boat, along Rue Saint Catherine. That was the end of the Bixi bike experiment. I think I would recommend the bike for riding along the canal but not for Mount Royal! 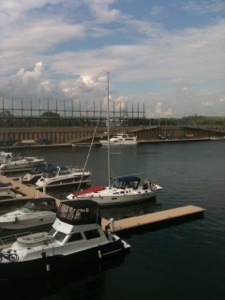 I have included a couple of pictures – one is of the boat from the quay beside it. 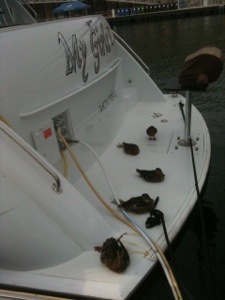 I also had to include the picture of the boat that the local ducks have adopted. I don’t think the owner is very happy with them! Well, we are still in Montreal and have decided to stay one more day so we will be leaving Wednesday morning for Trois Rivieres. Montreal is a lot of fun – there is so much to do! 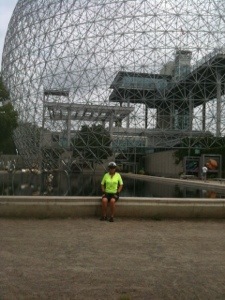 We rode over to the site of Expo 67. I was there in 1967 but none of it looked familiar! We bought supper for tonight and also bought some dark chocolate with blueberries. This was recommended by one the of workers at the marina – it was very good. 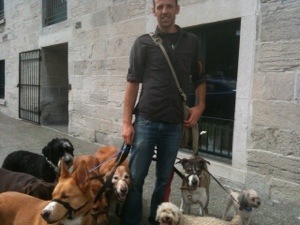 I had to include this picture today – I think that this would be the perfect occupation. You get lots of exercise and enjoy the company of dogs without having to be responsible for them all the time. 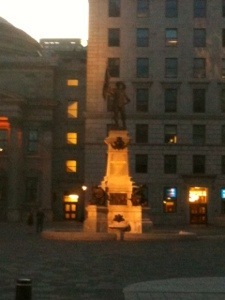 I also took some pictures of old Montreal last night. The first picture is of the Maisoneuve statue. 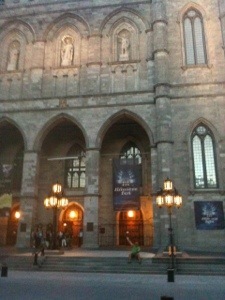 The second picture is of Cathedral Notre Dame. If you look closely at a speck of green, you will notice who it is! That is all the news to report today. 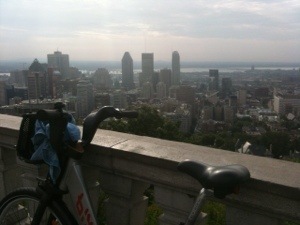 Tomorrow, we are going to bike to Mont Royal and also will look for authentic bagels.